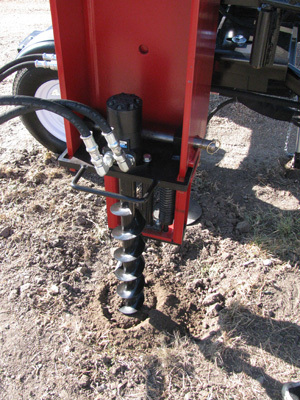 The optional Shaver Pilot Auger Attachment makes post driving in the toughest soil conditions even easier. The unit's powerful four-inch auger opens a pilot hole before driving the post. This new option reduces wear on the driver and significantly increases productivity by allowing the operator to drive posts more quickly. The unit is especially useful in tough, compacted soil conditions or when driving larger diameter posts (like railroad ties) and is available for both the HD-10 and HD-12 units. The optional "Positioner" lets you position the driver with pinpoint accuracy. 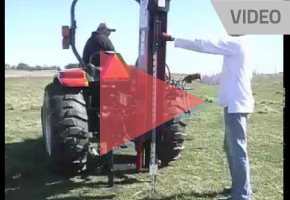 A hydraulic swivel rotates the driver up to 155 degrees and extends 24 inches past the tire, making it much easier to position posts without the need to move the tractor. The unit is available for all Shaver drivers. Self-contained unit with its own hydraulic system eliminates dirt and foreign material in the operator's skid steer loader's hydraulic system. Reduce setup time with Shaver's Quick-Tach system. 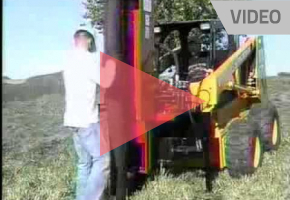 With the Quick-Tach bracket, you can hook up to any skid steer loader in no time. It's been very valuable to the company. We've been able to get a lot of posts in with it. It's very reliable. Check out the media available for Standard Post Drivers. 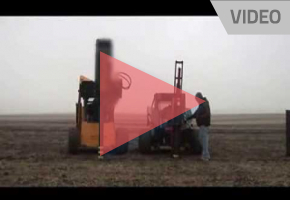 Learn more about the Post Driver Tractor Attachment. 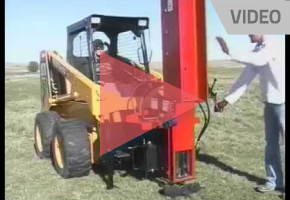 Learn more about the Post Driver Skid Loader Attachment. 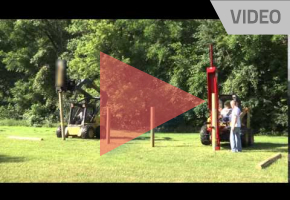 Watch how Shaver's post driver does against our competition. The standard post driver has been very reliable for Jason Dickenson and his company. 30,000 lbs. 71,500 lbs. 100,000 lbs. 360 lbs. 725 lbs. 1,100 lbs. 7 1/8" 8 3/4" 10 7/8"
486 lbs. 714 lbs. 957 lbs. 37 1/2"-55 1/2" 37 1/2" 37 1/2"
705 lbs. 680 lbs. 861 lbs. The specifications for Standard Post Drivers are subject to change without notice.